THE WRITING BUDDHA - Opinions | Books | Movies: Suvarna Mohur : India's Glorious History Illustrated through Rare Coins by Arun Ramamurthy (Book Review: 4.5*/5) !!! 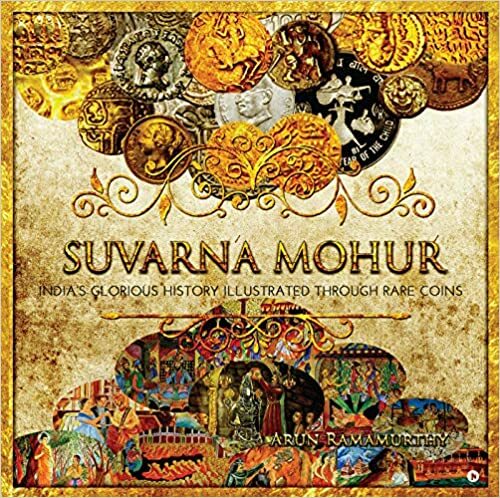 Suvarna Mohur : India's Glorious History Illustrated through Rare Coins by Arun Ramamurthy (Book Review: 4.5*/5) !!! I don’t think I have ever invested my time on any Coffee Table book except one before reading this latest book named “Suvarna Mohur” curated by Mr. Arun Ramamurthy. The cover page of the book is so colourful and bright that you would keep looking at it for some time before realizing that it also has great pages embedded within both the hard pages. I have been very bad in history since childhood and always avoided reading books having any kind of historical elements until it has not been represented in an easier manner. This book talks about history of 2500 years through the coins which were used during those contemporary times respectively which really made it very easy for me to digest the facts and years. I liked the kind of details author has managed to collate together to make this book possible. It is not an easy task to get such minute details about each era and then their relation with the coins. Even researching about all the coins mentioned in the book must have been a herculean task for the author. Many kudos to him for managing the same. The book is printed on shiny pages which makes the images of coin and other arts, paintings and pictures look very aesthetic and beautiful. The author has discussed different eras in history when India has been ruled by certain dynasty or king. The main milestones of their era have been talked about summarily to give the readers essence of their time and understand how they conquered India or the certain parts by raising wars against whom and with what kind of morality. I liked understanding how in a small piece of coin, the basis of their whole premise is depicted either in the form of an image, scripture or art crafted on it. Author has very nicely covered many kingdoms right from the Mauryan and Magadhan empire to Sangam era to Gupta era to Mughals to Rajput’s to Shivaji Maharaj’s arrival as a ruler to British India and finally the independent and Republic India. The author has done justice to every era described in different chapters ensuring that all the important facts are covered. Author has also written separate articles on some famous incidents from the respective eras too. The map is shared with each chapter to make it easier for the readers to understand which parts of India were covered during the respective reign. This book feels as if you have entered in a very big museum where all the historical characters are alive and are passing on their ruling powers from one dynasty to the other in front of your eyes. Also, you can imagine all these coins in your hands as author has described right from their size to their dimensions to what has been carved or scripted on it. I am glad I have this book in my shelf. I shall ensure that I manage to go through it every now and then to ensure I know everything about India and its rulers right from the beginning. This book is special and distinct for sure. I liked how author ended the book telling the readers about how time has changed where coins are becoming irrelevant and digital transactions such as cashless arrangements and bitcoins are gaining the momentum. Author should be appreciated for making this non-fiction book bifurcated into different chapters sound like a continuous fictional story. I give this book 4.5* out of 5.